Sometimes we forget how far video games have come. 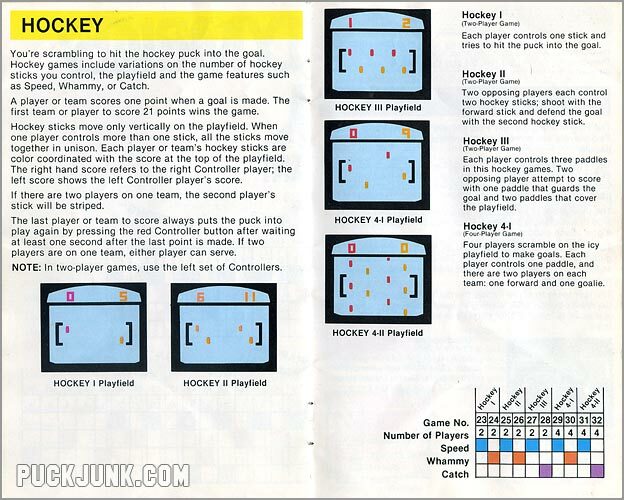 Those old enough to remember when Wayne Gretzky played for the Oilers probably got their start playing video games on the Atari 2600 – with games like Space Invaders, Combat, Surround and Video Olympics. Today, the ultra-realistic graphics and sound in games like “NHL ’09” make us feel like we are controlling an actual hockey game on TV – from the player’s stick movements to the line changes. That was not the case 30-something years ago, when your typical game was composed of basic shapes and bright colors underscored by boops and beeps for sound effects. That was it. No facial expression, jersey number, multiple camera angles or star around the skates to signify that a video game hockey player was following your commands. Oh, and no skates either. 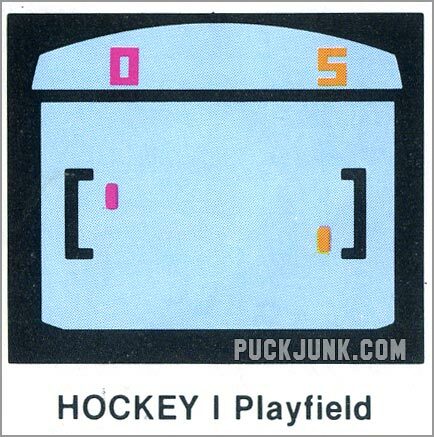 Released in 1977, the simplistic Video Olympics contains what is one of the earliest hockey video games. 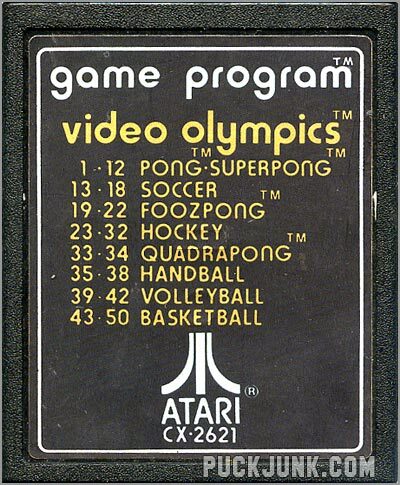 Eight different games were featured on the Video Olympics cartridge: Pong-Superpong, Soccer, Foozpong, Hockey, Quadrapong, Handball, Volleyball and Basketball. Not surprisingly, the play mechanics of all but the last two games were almost identical. 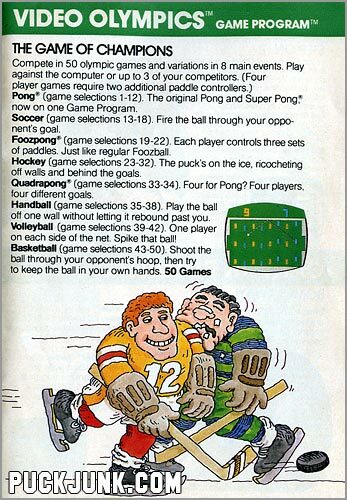 If you remember Pong – where you and an opponent each controlled a paddle and hit a ball back and forth – then it’s not too hard to imagine what Superpong, Foozpong or Quadrapong are like. 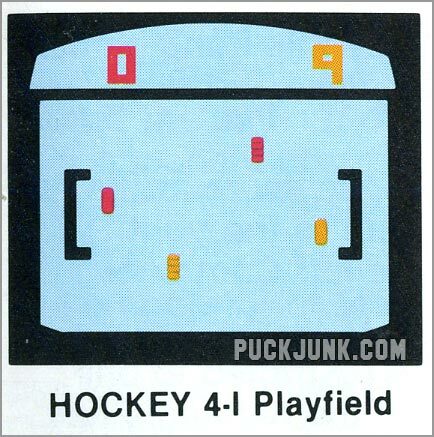 Hockey on Video Olympics was not much different than your standard game of Pong. The only major difference is that you are defending nets – shaped like [ or ] brackets – instead of having to protect the whole left or right edge like in a normal game of Pong. 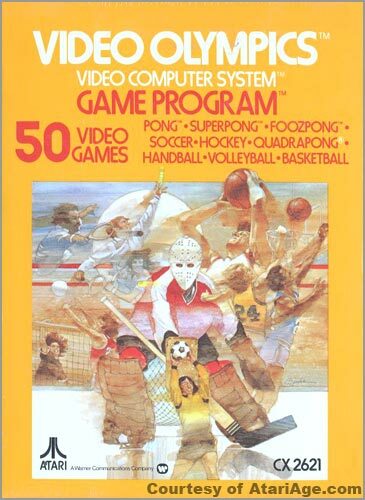 Like all video games made by Atari during that era, Video Olympics sports some really rockin’ box art. 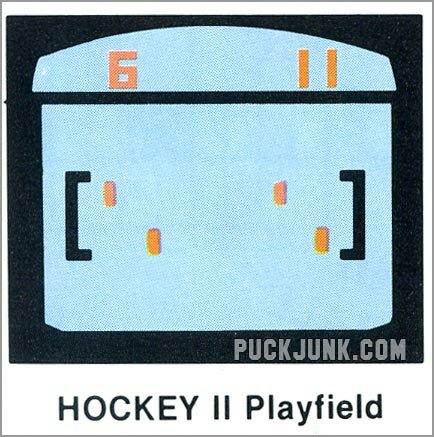 The illustration – also used on the instruction book and later the game cartridge itself – shows a montage of different athletes doing their thing. 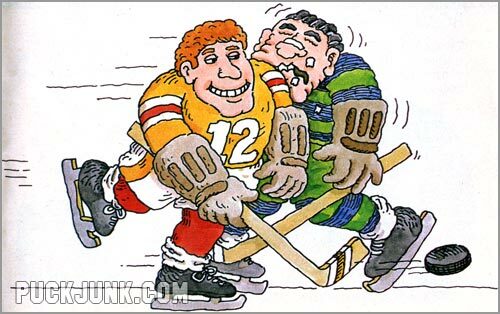 What makes the artwork so special to puckheads like us is the prominence of the hockey goalie, who is huge compared to the other athletic figures. In fact, he looks ready to swat at that pesky little soccer guy who is trying to steal the attention for himself. 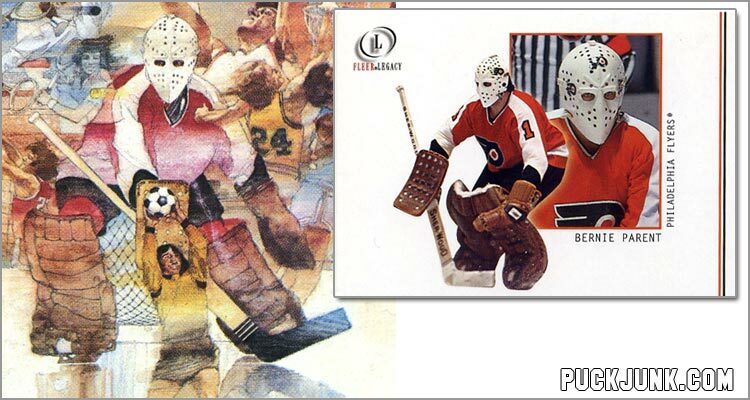 The hockey goalie on the box art was clearly intended to be Bernie Parent of the Philadelphia Flyers. Though he lacks a team logo or uniform number, the goalie’s mask is the same style as Parent’s, and his jersey is in Flyers’ colors. Alluding to Parent was a good choice, as he won playoff MVP honors in 1974 and 1975 when the Flyers won the Stanley Cup those years. 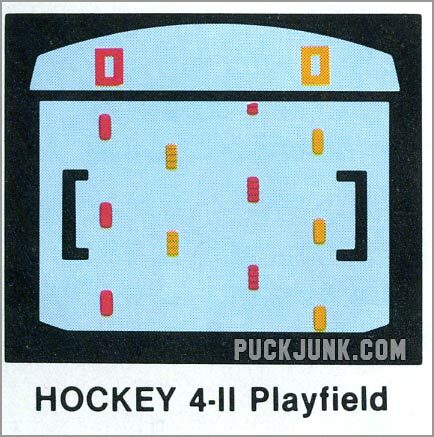 This game will most likely bore you, unless hockey-masquerading-as-Pong is your thing. 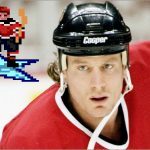 It does not hold up well like games from the 1980s, like Blades of Steel or Ice Hockey, but that’s an unfair comparison anyway – games from the 8-bit era withstand the test of time better than their predecessors. 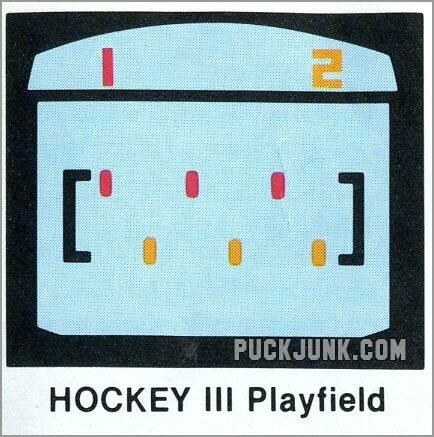 The box art for Video Olympics is very cool, and the game might be nice to own because of the artwork and because of its place in hockey video game history. 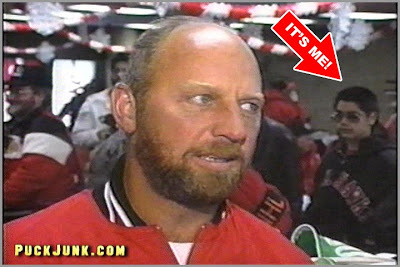 I must extand a special thanks to Al Yarusso, webmaster of AtariAge.com, for providing me with some of the images for this article. You know I can’t do a review with just four images, so here’s everything I could find about this game. 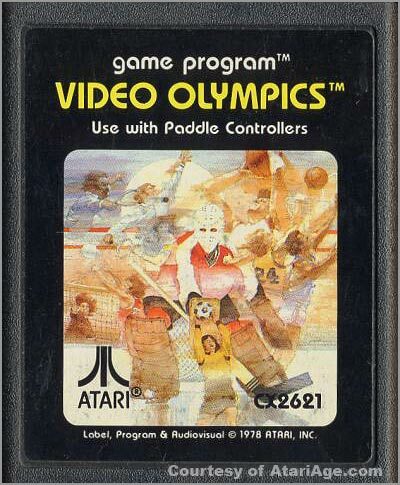 Video Olympics game cartridge version 4. 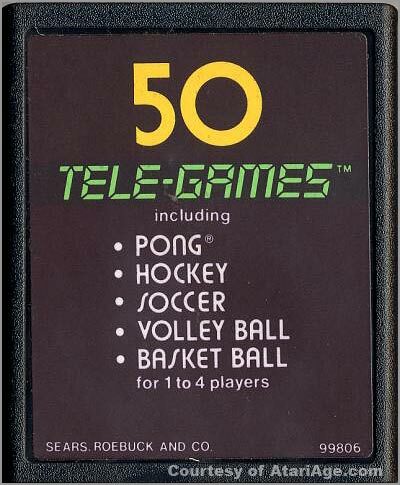 The game was re-named “Pong Sports” when it was sold by Sears for their Tele-Games system. 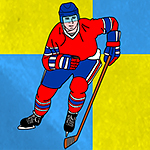 Different variations of Hockey in Video Olympics. 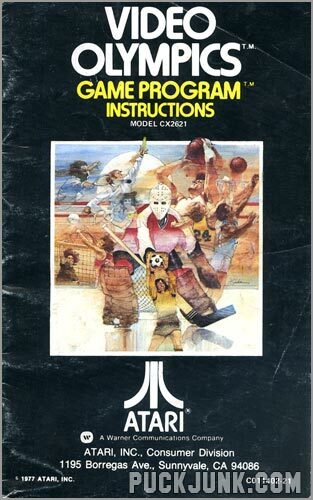 The game instructions and box. 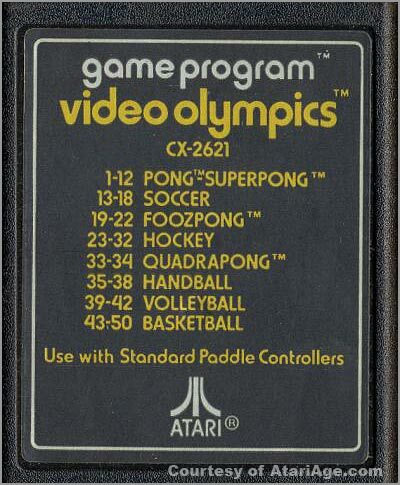 Page about Video Olympics from an old Atari 2600 game catalog. Is that Pele Lindberg on the cover? It's funny to me that they just combine the summer and winter Olympics into one pong oriented game. 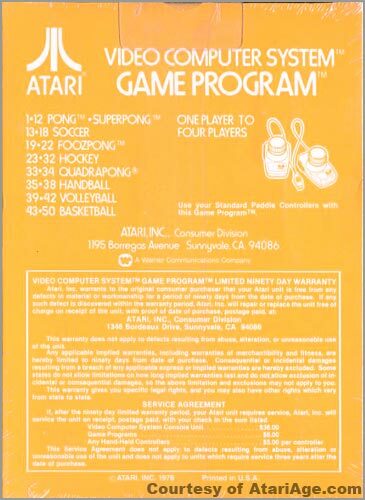 Ah Atari. Simpler times. P.S. I finally sent you that pkg the other day, because it was sent back to me for more postage, but you should get it soon, hope you enjoy it.